Where to go on 34th Street for Fashion's Night Out? You've got a lot of options. There's a great resource for all city events listings on the Fashion's Night Out website, just click on "Neighborhood" and then "Herald Square." But where am I going? Macy's Herald Square, of course, and a drop by as many others between Fifth and Seventh Avenues on the way (more details on that tomorrow). All the festivities start early evening on Thursday night, but you can kick off the fun now by entering to win a $50 gift card from Macy's. Leave a comment here on the blog with your email,* and you're entered to win. Winner will be chosen by drawing on Friday September 9th at noon (contest ends at noon), the day after FNO. You can also follow me on Twitter and retweet my contest mentions for another entry. Get the gift card and shop Alternative at Macy's Herald Square if you're in town (left), and if you're not, order that Bar III vest (right). Do I need to go on and on again about Bar III?! Let's just say it's one of the first departments I went to when shopping for fashion week. 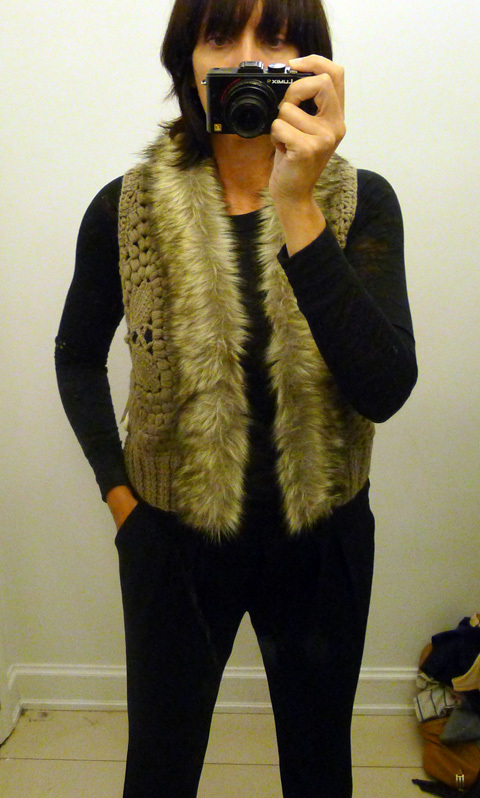 Love all things Bar III and especially this vest!! I forgot my twitter handle it is Nilimonicky. My comment is above. thanks for the chance..I heart Macys!! Loving you guys, Barlll. Love the vest - stunning! I'd love to enter for a Macy's gift card!